It has been 24 hours since I climbed up, and then into Kawah Ijen, and despite much washing of clothes and body I can still catch the faint smell of sulphur. The volcano is in far east Java, active and overdue an eruption, with the last major one being in 1936. What brings the more adventurous traveller here is the unique 'Blue lava' at the base of the crater, and the Sulphur miners who work in some of the hardest, and most dangerous, conditions in the world. I set off from my hotel in Banyuwangi at midnight, a time I thought was only reserved for attempts to climb the peak of Everest. A 4WD took me and my guide on a tortuous two hour journey on a badly maintained road to the car park half way up the Volcano. Then the hike began, a gentle slope soon turned into steep path zig zagging over loose rocks, ash and soil for 4 kilometres until we reached the rim of the Volcano. It was pitch black, and only the stars and the distant lights on the island of Bali were visible. After a short rest we descended into the crater. The path is slippery with many uneven rocks to tread carefully on. Only when returning in daylight did I see the sheer drop on the side of the path. My guides advice to stick to the left at all times was worth heeding. Even at this ungodly hour of the morning we frequently had to squeeze into a crevice or ledge to let the miners with their two huge baskets of sulphur squeeze past. The smell of sulphur gas was increasing, and I was preparing to put on my mask when we were caught unaware in the darkness as a cloud drifted past burning the throat and stinging the eyes. Hurriedly putting on my mask, and facing the other direction until the cloud passed, we slowly began the final descent to the source of the sulphur. 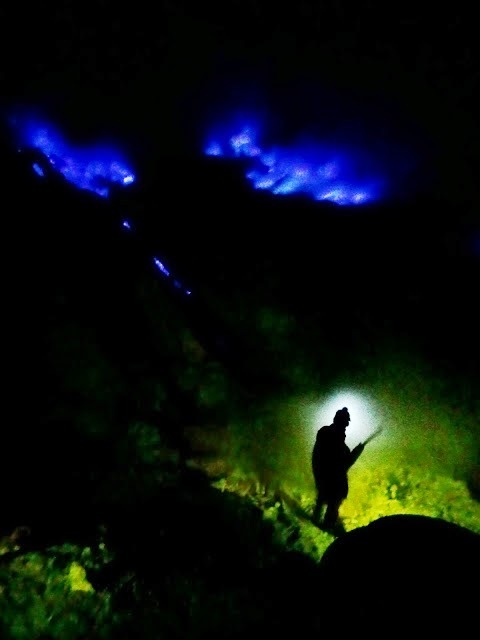 The rare 'Blue lava' is in fact sulphur igniting as it leaves the volcano at a temperature of over 600 degrees celsius and then condensing into a blue liquid form and moving down the slopes like lava. It has been seen at Vesuvius and other volcanoes, but only when they are in full eruption. Unique to Ijen it is visible in the crater at certain times when not in eruption, currently (March 2014) it can be seen between 2AM and 4AM, albeit through the clouds of dangerous sulphur gas. Beautiful and deadly, the miners worked around it with only a head torch for light, frequently running away to escape the poison gas, before returning to hack more sulphur out to fill their baskets before slowly climbing out of the volcano. As we waited for sunrise, we saw that everything, including us now, was covered in fine yellow sulphuric dust. The lake in the crater was bubbling away gently, nothing could live in its acidic waters. As we began the journey up and out of the volcano, I was very thankful that I only had to do this unforgettable journey once. * I recommend Iwan as a guide. Good English and an irrepressible sense of humour once he gets to know you. His constant encouragements of "over half way there" kept me going, even when we had not traveled that far! He can be contacted at iwandwipraestyos@gmail.com or on 081-336174673. * In Banyuwangi I recommend staying at the Ritansa Roebuck, clean and good location. Rooms from 150,000 Rupiah. Contact reservations@ritsanaroebuck.com or on 0333-416896. * If you descend into the volcano, and not all tourists do as there are great views from the crater, take a mask and go slow. Tourists are actually prohibited from entering the crater, there is a sign on the crater rim only visible in daylight and ignored by all. But it is dangerous, a French tourist died on the descent a few years ago.